MOSCOW, February 12. /TASS/. The Russian military test fired an upgraded air defense missile at the firing range Sary-Shagan in Kazakhstan, Russian newspaper Krasnaya Zvezda reported on Monday. "We have successfully test fired a new upgraded air defense missile," the newspaper quoted Andrei Prikhodko, the deputy commander of Aerospace Forces’ air and missile defense task force, as saying. 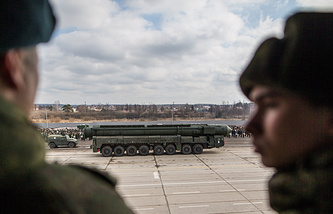 "The missile’s tactical and technical characteristics regarding the range, precision and operational lifetime are significantly higher compared to present-day weapons," Prikhodko said. The new upgraded air defense missile is capable of intercepting single and multiple strikes, including with the use of new generation intercontinental ballistic missiles, he added.